China is the world’s largest e-commerce market. It made over US$458 billion in sales in 2014 and global, international e-commerce sites control a market share of over 92 percent, foreign engagement with the Chinese online retail sector is at it’s most prolific. By 2020, China’s e-commerce sales are expected to hit 1.1 trillion dollars! Just enormous! Here, we will show you the differences between leading e-commerce platforms Tmall Global, JD and Yihaodian to see how they rate for foreign merchants willing to sell to China’s enormous and lucrative market. 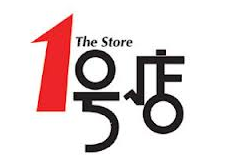 Tmall is China’s largest online marketplace selling domestic and international branded merchandise. Tmall is owned by the Alibaba Group. It provides a marketplace for foreign brands to open exclusive shop fronts. 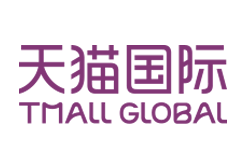 Tmall Global was launched back in 2013. It only sells imported goods. Thanks to Tmall international, brands without a physical presence in China can sell directly to Chinese consumers. Therefore, it is a great opportunity for foreign brands willing to sell in China without a physical location all the costs and level of risk associated with this. However, Tmall Global now operates via an invitation-only policy where only qualified merchants are either invited to join or may apply through a certified third party agency (TP). Consequently, the necessity of TP cooperation has complicated the process of building up a store on the Tmall Global platform. For foreign companies looking to set up an online store with no physical presence, JD Worldwide is an increasingly more attractive option. You must have a registered corporate entity outside of mainland China. You must possess retail and trade qualifications overseas. You must be the brand owner or authorized agency or possess the purchase voucher. You must possess the relevant stock certificate. Corporations that have been operating for over two years with annual sales exceeding US$10 million. Branded B2C overseas businesses. Brand owners or authorized agencies. Tmall Global gives merchants an e-commerce platform and various marketing tools to help increase traffic and generate sales. Tmall Global cooperates with certain FTZs in China to provide select merchants with a bonded warehouse service. Merchants should either ship packages straight from overseas, or store their products in a bonded warehouse in China for shipment to consumers. A Chinese address is mandatory to ease product return. Security Deposit – US $25,000. Technical Fee – US $5,000 or US $10,000, per annum. Commission – 0.5 % – 5 % + 1 % Alipay fee. Large international brands with demonstrated potential to achieve a large volume of sales or high revenue. Hypermarkets, like JD and Yihaodian, allow independent sellers to list products or operate shop fronts. Online hypermarkets are vertically integrated, multi-category marketplaces that purchase straight from suppliers in order to sell through their own network. These hypermarkets operate a proprietary online e-commerce platform and an in-house logistics network providing same-day delivery. Selling to a hypermarket is done via negotiation with a procurement manager. Exporters are not required to manage distribution or a shopfront, but must provide official marketing collateral to promote their products. Check out the summary table at the end of this article for the the full description. JD is China’s largest online, direct sales company. JD owns and operates seven fulfillment centers and over 160 warehouses in over 40 cities, with a further 4,142 delivery stations in over 2,000 districts across China. JD allows sellers to open individual shop fronts and can import food, beverage products, apparel and shoes straight from overseas. JD’s cross-border service, JD Worldwide, allows merchants to sell straight to Chinese consumers without a Chinese presence. JD distinguishes itself from Tmall Global via active global promotion of JD Worldwide (particularly in the U.S. and Australia) and provision of a leading in-house logistics service. Furthermore, JD boasts a zero tolerance policy with regard to counterfeit products. Possess the relevant stock certificates. Franchising Business Partner – It allows sellers to build up store in JD and get facility to use JD warehouse to stock their own products. JD takes full responsibility providing warehousing, delivery and customer service. 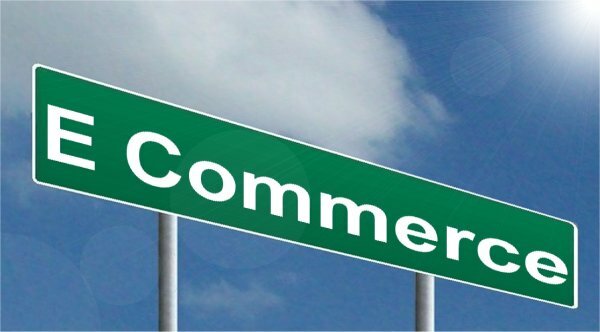 Which is a great thing for merchants! Licensing Business Partner – Merchants can set up store and complete packaging in order to ship the order. JD will supervise customer service and process invoice. JD offers both the e-commerce platform and comprehensive packages for logistic and warehouse services. JD’s net revenues for the second quarter of 2015 were US$7.4 billion, an increase of 61% year on year. And we are sure JD will keep increasing, as China’s e commerce will hit 1.1 trillion $ by 2020! Merchants can use a warehouse service provided by JD through selected packages. Sellers can use a logistic service provided by JD through selected packages. JD’s 211 same-day and next-day delivery program covers 135 and 951 counties and districts, respectively. Security Deposit RMB 10,000 – RMB 50,000, depending on the product’s category. Technical Fee – RMB 6,000 per year. Commission 5-7 %, plus 0.85 percent if the JD shipping service is used. Suitable for: JD dominates the home, appliance and consumer electronics categories in China and therefore favors 3C products. Yihaodian is China’s biggest online retailer of food and beverages, stocking more than 8 million SKUs. The platform is fully owned by American retail giant Walmart and is licensed to import food & beverage products directly from overseas. In 2013, Yihaodian has sold around 250 million imported products, including one-third of all imported UHT milk sold online in the Middle Kingdom. With a similar logistics system to JD, Yihaodian has seven warehouses and operates over 200 distribution centers in forty cities. Yihaodian allows foreign companies to sell tax-free and to be exempt from Middle Kingdom’s domestic product standards through ‘cross-border’ e-commerce. Enterprises are often free from VAT, license/permit and Chinese label requirements. The platform represents an exciting opportunity for fresh food and beverage exporters. Applicant must be a Chinese mainland-incorporated company. Have relevant tax registration certificate (either national tax or local tax). Current business license which passes annual inspection. Possess relevant trademark registration certificate or a notice of acceptance of application for trademark registration. Declaration of imported goods must be issued by China Customs within two years of application. Inspection certificate issued by Entry-Exit Inspection and Quarantine Bureau within two years of application. • How Yihaodian has become very successful in e-commerce in China? Yihaodian’s cross border e-commerce model allows foreign sales which are tax-free and exempt from China’s domestic product standards. Last year Yihaodian has set a, amazing Guinness World Record for selling a hundred containers (2 million boxes) of imported milk in just 51 minutes. Can you believe it ?? Sellers must use a comprehensive warehouse service provided by Yihaodian. Sellers have to use logistic service provided by Yihaodian. Technical Fee – RMB 500 per month. Yihaodian is specialized in the sale of fresh food and beverages. 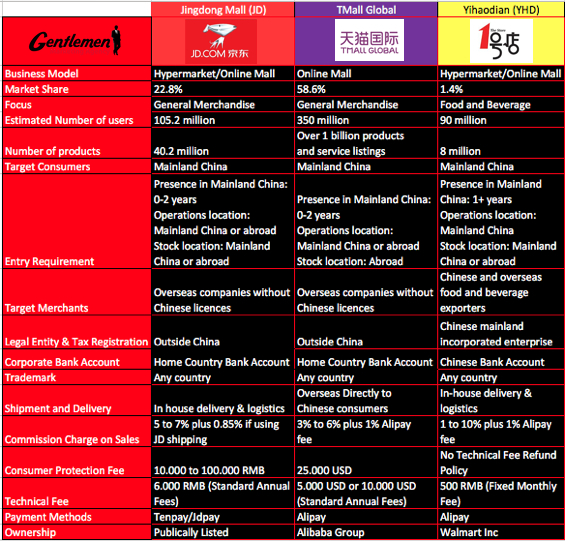 Here is the summary table of JD.com, TMall Global and Yihaodian. Enjoy ! TMall Global, JD and Yihaodian allow foreign enterprises to choose which site will suit best for their products. If you are a foreign company interested in selling your products to the Chinese market, our experts can help you analyze which platform is best for you to sell your products. Then, they will also help you to set up your e-commerce store. Contact us here if you want more information. Our experts have much experience in this field. Their knowledge of this fascinating e-commerce market is vast. I am e retailer. Our company sells Consumer eelectronics, Home and kitchen accessories, Automobiles accessories etc. I am from India .We sell on Amazon.com,Amazon.in and many.Now i want to sell in Chinese marketplaces like Tmall,Taobao,JD and Yihaodian etc. 2.Can i sell on Taobao whichout having physical existence in china? ? We will send you an email . We are a wholesaler and online clothing retailer selling a wide variety of products on Amazon, eBay and our own independent website ( http://www.adamandeesa.co.uk ). We sell in the UK, across Europe and to the US and have been trading now for over 6 years. A large part of our range includes socks, hosiery and night wear, including officially licensed character merchandise. These include pyjamas, onesies, hats, socks & underwear, bags, bedding & blankets featuring Paw Patrol, Finding Dory, Simpsons, Disney Frozen, Mickey & Minnie Mouse, Marvel Avengers, Spiderman etc. We are now in the process to expand our Business and would like to sell our product to more globally, like Tmall,Taobao,JD and Yihaodian etc. Could someone please advice us where to start? If you have any further queries do not hesitate to contact us. Our New Warehouse is based in Manchester. Our company, based in South Korea, exports Korean cosmetic products and others that buyers need. It has been widely very popular in Korea, and we figured it will be demanded highly in China as well. Korean beauty products have been very popular in China and other Asian countries so far. And for our products, we will eventually export it worldwide, but China has become one of our top choices to export to. So now, we are looking for buyers or sellers from China mainland. For anyone who is interested in our products, I will send you an email on our company overview and product overview. I promise this product will be a trendsetter as it not only helps looses weight but also good for health as it being vitamin.